Researchers have developed a method for improving the accuracy of the CRISPR genome editing technology by an average of 50-fold. The researchers believe their method can easily translate to any of the editing technology’s continually expanding formats. 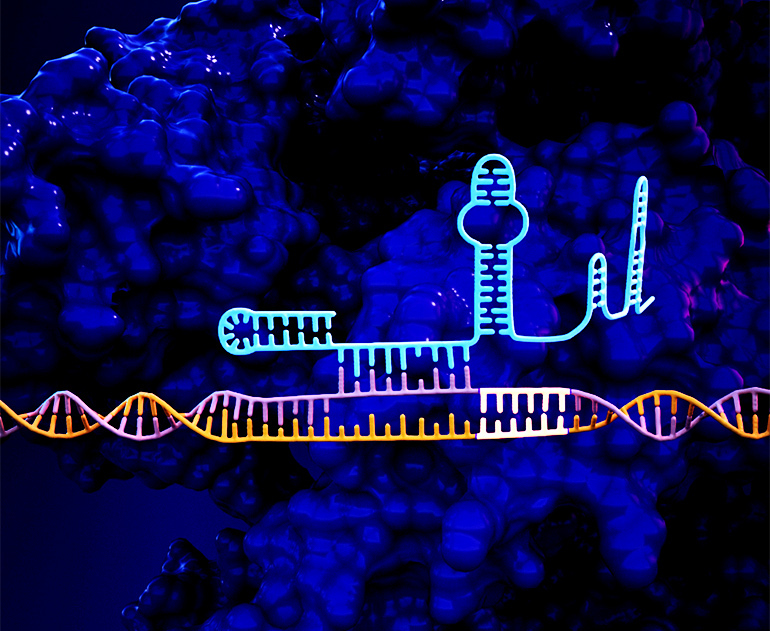 The approach adds a short tail to the guide RNA that scientists used to identify a sequence of DNA for editing. This added tail folds back and binds onto itself, creating a “lock” that only the targeted DNA sequence can unlock. A universal property of CRISPR systems is their use of RNA molecules as guides that home in on the targeted DNA sequence in the genome. Once a guide RNA finds its complementary genetic sequence, the Cas9 enzyme acts as the scissors that make the cut in the DNA, facilitating changes to the genome sequence. Because each homing sequence is only 20 nucleotides long and the human genome contains about three billion base pairs, however, there’s a lot to sort through, and the CRISPR can sometimes make mistakes with sequences one or two base pairs short of perfection. One way to improve CRISPR’s accuracy is to require two Cas9 molecules to bind onto opposite sides of the same DNA sequence to make a complete cut. While this approach works, it adds more parts to the system, increasing its complexity and making it harder to deliver. In another approach, researchers genetically engineer the Cas9 protein to make it less energetic, so it’s less likely to jump the gun and make a mistake. While this has also shown promising results, this type of protein engineering is laborious and such efforts are specific to each CRISPR system. “We’re able to fine-tune the strength of the lock just enough so that the guide RNA still works when it meets its correct match,” says Kocak. In the paper, Kocak and Gersbach show that this method can increase the accuracy of cuts made in human cells by an average of 50-fold across five different CRISPR systems derived from four different bacterial strains. And in one case that improvement rose to over 200 fold. Moving forward, the researchers hope to see just how many different CRISPR variants this approach could work with as well as complete an in-depth characterization of exactly how the locking mechanism works to see if there are differences across CRISPR variants. Because the researchers conducted the experiments in cultured cells, they are eager to see how well the approach might increase CRISPR accuracy within an actual animal model of disease. The study appears in the journal Nature Biotechnology. The Paul G. Allen Frontiers Group, the National Institutes of Health, and the National Science Foundation supported the work. Can more ‘flags’ help CRISPR treat Duchenne muscular dystrophy?